I’ve said it before and I’ll say it again… George Steinbrenner is bad for baseball. His overpayed and overrated team has finally got what was coming to them. 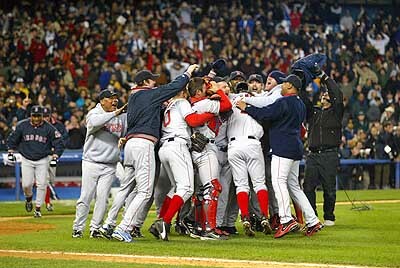 Props to Boston for being a real team and spanking the Yankees in the Bronx. Now it’s the Cubs’ turn. "Who’s Your Daddy" by Jeremy Felt, unless otherwise expressly stated, is licensed under a CC BY-SA 4.0 International License. Previously: Where is the love fear?